Figs, one of mankind's oldest fruits, is only now receiving its due attention in homes across the United States. Although considered a fruit, the fig is actually a flower inverted into itself. They are the only fruit to ripen on the tree. 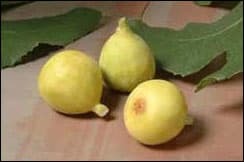 Originally native from Turkey to northern India, the fig fruit spread to many of the Mediterranean countries. The primary producers of dried figs today are the United States, Turkey, Greece, and Spain. This highly nutritious fruit arrived in the United States by Spanish missionaries settling in Southern California in 1759. Fig trees were soon planted throughout the state. One serving of figs is 40 grams, about 1/4 cup, or about 3 Calimyrna figs or about 4 to 5 Mission figs. Figs are high in fiber, providing 20% of the Daily Value - more dietary fiber per serving than any other common dried or fresh fruit. There are hundreds of fig varieties but the following are most commonly found in today's markets. Dried figs are excellent replacement for fat in baked goods. Just remember when using dried figs to replace shortening or oil in baking do not overmix or overbake. Use only half of the normal amount of shortening, margarine, butter or oil, in a recipe when using dried puree. For instance, if 1 cup of margarine is called for, use only 1/2 cup. Then use 1/2 of the fig puree. Here's a simple fig puree recipe to include in your baking recipes. Take some figs in a plastic bag to the office, to school, to the game or park, for a quick snack. They are easy to eat and satisfies a sweet tooth. Keep a container of figs in a desk drawer at work, to get rid of late afternoon munchies, or to include during your coffee break. Slice a few figs and add to your tossed green salads. They add sweetness and texture, as well as fiber. Serve mashed or cubed winter squash or sweet potatoes with some chopped figs. The figs are rich on their own, so skip the butter or margarine. Combine lime juice, honey, soy sauce, pepper flakes and gingerroot in medium bowl; mix well. Add chicken, figs, onions and mint; toss to coat evenly. Cover and refrigerate for one hour. Stir occasionally. When ready to serve, combine cantaloupe, pepper strips and cucumber with marinated chicken and toss gently but thoroughly. Line serving bowl or salad plates with greens and arrange mixture in center. Garnish with mint sprigs if desired. Nutritional analysis per serving: Calories 326, Protein 27g, Fat 7g, Calories From Fat 18%, Cholesterol 98mg, Carbohydrates 45g, Fiber 8g, Sodium 460mg. Remove stem ends from figs and cut each in half lengthwise. Combine ricotta, honey, lemon peel, orange peel, and vanilla in a small bowl until well blended. 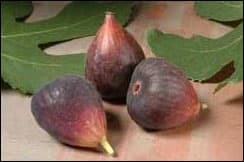 Serve figs with ricotta mixture. Garnish with chopped nuts. Nutritional analysis per serving: Calories 292, Protein 7g, Fat 2g, Calories From Fat 6%, Cholesterol 10mg, Carbohydrates 60mg, Fiber 5g, Sodium 66mg. Place figs in saucepan with 1 cup water on medium heat; cover. Simmer 5 minutes. Remove from heat; rest 15 minutes. Puree 1-2 minutes in blender or food processor. Spray medium skillet with nonstick spray. Heat on medium to high; toast one tortilla at a time, pressing to toast evenly. Spread 2 Tbsp fig puree over toasted tortillas; top each with 1 slice prosciutto and 1 1/2 Tbsp Gorgonzola. Place tortillas on baking sheet and bake on center rack 10-12 minutes, until cheese starts to melt and prosciutto becomes crisp. Remove and garnish with chives; cut in wedges. In small saucepan, combine figs and marinade ingredients. Cover and bring to boil. Reduce heat and simmer for 1 minute. Remove from heat and cool for 15 minutes. Meanwhile, cut eggplant lengthwise into quarters. Slice one quarter crosswise into thin wedges, about ¼-inch thick. Cut pepper and onion into 1 1/2-inch squares. Remove figs with slotted spoon, reserving marinade and two figs. For kebabs, alternate eggplant, onion, pepper and figs on skewers. Set aside and prepare dressing. Dice the two reserved figs and combine with ¼ cup reserved marinade; add to Citrus Dressing. Grill or broil kebabs 5 inches from heat source, brushing with remaining marinade and turning every 3 minutes. Grill for 6 to 10 minutes or until eggplant is soft. Toss lettuce with remaining dressing; place on 4 plates. Sprinkle with cheese and nuts then top with kebabs. Nutritional analysis per serving: Calories 345, Protein 10g, Fat 12g, Calories From Fat 29%, Cholesterol 8mg, Carbohydrates 51g, Fiber 13g, Sodium 309mg. Cut stems from figs and cut into quarters. Place figs and orange juice in a small microwave-safe bowl. Cover and microwave on high 1 minute. Set aside. Place each chicken breast between 2 sheets of plastic wrap and pound until thin. Combine honey and mustard. Spread 2-3 tsps on each chicken breast; top with one slice of prosciutto. Place about six fig pieces in center of chicken. Reserve orange juice and remaining figs. Fold in sides and ends of breast; secure with toothpick. In skillet over medium high heat, melt butter. Add chicken and cook 4 minutes on each side. Combine broth, cornstarch, orange peel and rosemary with reserved orange juice and figs; pour over chicken. Cook covered 2-3 minutes until sauce is slightly thickened. Remove toothpicks and serve. Nutritional analysis per serving: Calories 370, Protein 31g, Fat 6g, Calories From Fat 14%, Cholesterol 80mg, Carbohydrates 51g, Fiber 7g, Sodium 425mg. Division of Nutrition and Physical Activity, National Center for Chronic Disease Prevention and Health Promotion. CDC: "5 A Day: Fruit of the Month: Figs."